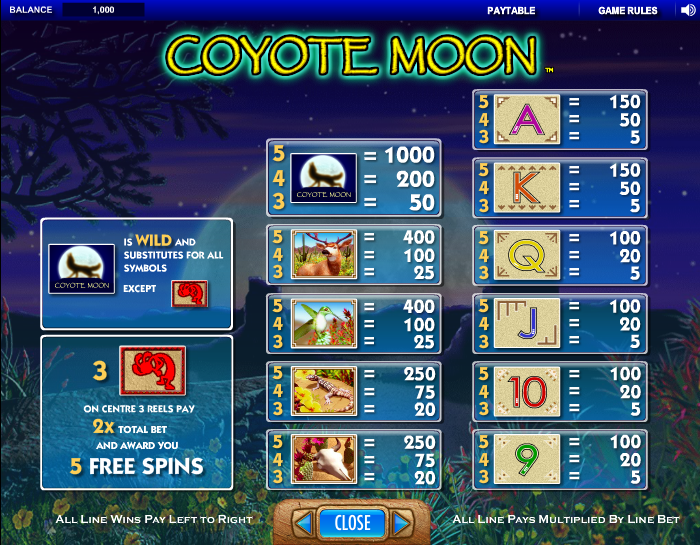 Coyote Moon is an online slot from IGT which brings to mind desert locations in the southern United States and slots fans will of course be aware of the ancient Anasazi culture which existed in the region up to 2000 years ago. Whether IGT have based this slot on ancient civilisations is another matter but it’s a fun game nonetheless. IGT use a certain template for a number of their slots and this one is certainly similar to, for example, 100 Pandas but that shouldn’t detract from what is an entertaining trip into the desert. The backdrop to this five reel and forty payline game is a full moon in the night sky and the lower value symbols are standard playing cards. Higher value symbols include a bleached animal skull, a lizard, a hummingbird, a deer and a coyote howling in front of a full moon. The coyote is also the wild symbol while the scatter is a hand-drawn red figure. That red figure is the bonus symbol and you’ll need to land three of these funky figures on reels two, three and four to trigger the free spins game. You’ll immediately win 2x your total bet and then you’ll get five free spins as you can see from the video clip below. When you are playing the free spins round you will notice that the red figure changes to green and the other symbols all take on purple hue. Landing three of the green symbols will re-trigger the bonus in the same way and this can continue indefinitely. Each reel contains a set of stacked coyote wild symbols and these can contribute to big wins, especially when you manage to land more than one on any particular spin. In the Rising Moon Bonus more stacked wilds are added. 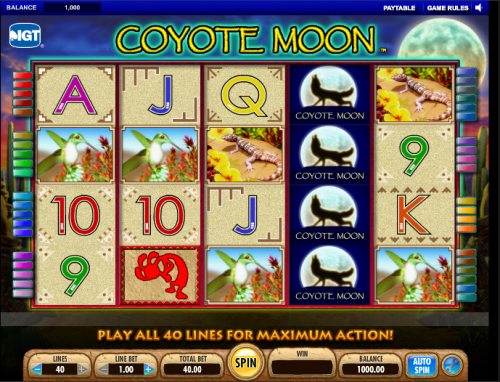 Although based on a familiar template, Coyote Moon is an eminently playable slot with some nice graphics and animations. The soundtrack to the game also contains some appropriate howling noises.